Dell has come to CES with a boatload of goodies including a “smart workplace” hardware device known as the Dell Canvas. Late last year when Microsoft announced its Surface Studio PC, Dell was quick to point out that it had been working on a very similar product since 2014. That device, referred to as the smart desk, ultimately evolved into the Canvas that Dell is showing off this week in Las Vegas. Unlike the Surface Studio, Dell’s Canvas isn’t a full-on PC but rather, a 27-inch display that can be used at an angle or flat on a desk. 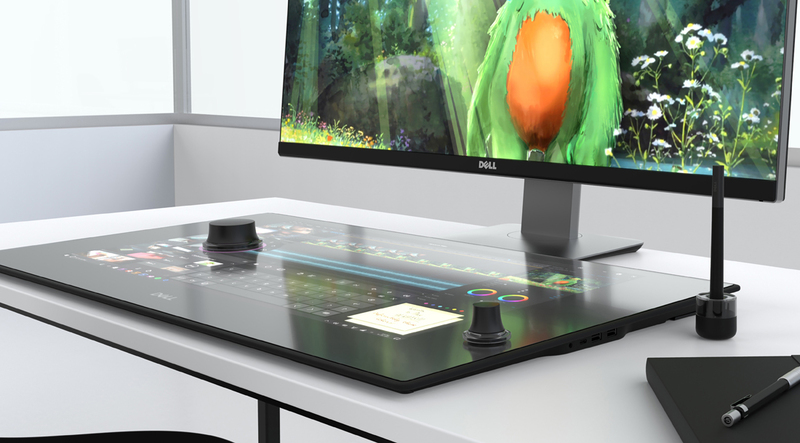 Think of it as an oversized drawing tablet that accepts input via touch, with a digital pen or with a totem – Dell’s name for its Surface Dial clone. Because it’s not a standalone computer, you’ll of course need to connect it to your existing machine as a secondary display. This fact may turn some people off and send them Microsoft’s way but then again, it’ll be a lot cheaper for that exact reason. What’s more, the QHD resolution of 2,560 x 1,440 pales in comparison to the 4,500 x 3,000 resolution of the Surface Studio’s 28-inch screen. Interestingly enough, Dell says its Canvas was developed in partnership with Microsoft and thus, is compatible with virtually any Windows 10 device. There are even custom software solutions in place from partners like Adobe, Autodesk, Dassault Systems and SolidWorks, just to name a few. The Dell Canvas will launch on March 30 priced at $1,799, far cheaper than the $2,999 starting price of the Surface Studio.